Heat the oven to 375 degrees. In a medium bowl mix together the fruit, 1⁄2 cup flour and 1⁄4 sugar until well the fruit is well coated. Transfer to an 8-inch by 10-inch or a 9-inch by 12-inch greased gratin pan or baking dish. Press down on the mixture with a spatula to make an even layer with no gaps. Place on a baking sheet. To make the custard: In a medium bowl, with a whisk, beat the eggs well. Add the creme fraiche and vanilla, and whisk until blended. Sift in the flour, whisking well to make sure the custard is smooth and no lumps remain. To make the topping: In a mixing bowl, combine the brown sugar, 1 cup flour, salt and lemon zest, and mix together. Add the vanilla and melted butter and mix until a soft dough forms. Spread an even layer of the custard mixture over the fruit. 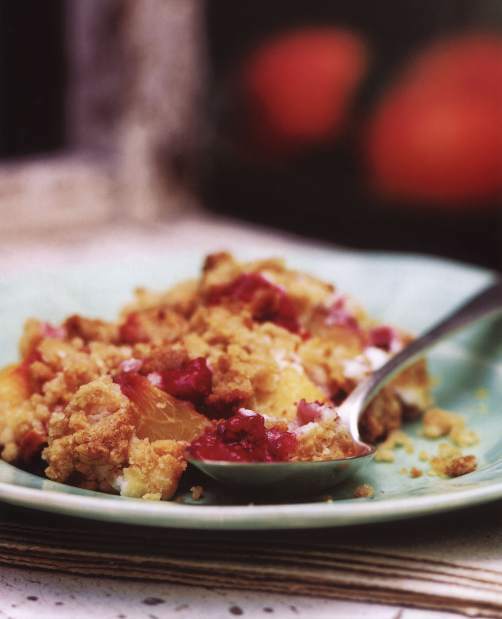 With your fingers, evenly crumble the topping over the fruit. Bake for 35 to 45 minutes or until the top is golden brown and completely cooked through. Serve immediately. You can serve this at room temperature. This may be prepared 8 hours ahead, covered and kept at room temperature before serving. Heat in a 375-degree oven for 10 minutes before serving. Don’t bother peeling the peaches or nectarines. Slice them in half and then scoop out the pit with a spoon. Cut into pieces. Try this same recipe using plums or nectarines instead of the peaches and blackberries instead of the raspberries.